Cape San Blas, Florida - In the Florida panhandle, a peninsula reaches into the emerald waters of the Gulf of Mexico, known as Cape San Blas. Once heavily damaged by Hurricane Katrina, this vibrant town has rebuilt into a lively spot with family- and pet-friendly amenities. Learn more here! Cape San Blas, Florida - In the Florida panhandle, a peninsula reaches into the emerald waters of the Gulf of Mexico, known as Cape San Blas. Once heavily damaged by Hurricane Katrina, this vibrant town has rebuilt into a lively spot with family- and pet-friendly amenities. Because Cape San Blas juts right into the gulf, there are many Florida beachfront properties here with gorgeous views of the water on both the sunrise and sunset sides of the peninsula. Throughout Cape San Blas, pets are welcome on most stretches of shoreline, and there are pet waste stations along the beach access points. T.H. Stone Memorial St. Joseph Peninsula State Park was named the best beach in America in 2002. This beach is great for kayaking, boating, fishing, and scallop hunting (Scallop season runs from July 1 to Labor Day weekend.). Family-owned restaurants near the beach serve up freshly caught Florida seafood. This is one beach where dogs are not welcome, so leave your furry friend in your Cape San Blas beach house when you visit the state park. There are several beach and forested parks near your Cape San Blas beach house that have a variety of amenities. 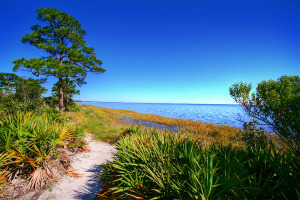 Cape Palms Park is about five miles down Cape San Blas Road. This new park provides public access, covered pavilions, restrooms, showers, grills, and a playground. 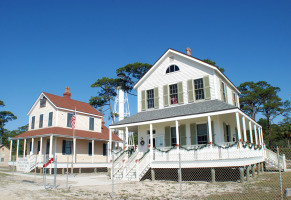 Salinas Park is close to the end of the Cape San Blas Road, just where the peninsula begins. The boardwalk here is handicap accessible, and there are picnic areas, a public restroom, and a new bike path that runs along the bay side of the peninsula. If you've booked a horseback excursion on the beach, this park will likely be your starting point. Local equestrian companies (Two-bit Stable Horseback Riding on the Beach, Broke-A-Toe Horseback Riding on the Beach, and The Rockin M Ranch) provide a variety of horseback riding packages for romantic dates or unforgettable family outings. As you enjoy your time on these amazing gulf beaches, note the sea turtle nests marked in yellow tape. This is an active sea turtle community, so you are likely to see mothers making their way to nests to lay eggs and newly hatched baby turtles trekking toward the ocean. Turtle season runs from May through October. You can walk the beach with Turtle Patrol volunteers to learn about these beautiful animals, and you can help promote this miraculous renewal of sea life by practicing "leave no trace" principles when you visit Cape San Blas beaches.